The Problem: In 2017, employers across the United States have been assessed millions of dollars in civil penalties for I-9 violations and employment discrimination. In addition, some companies are having their business licenses revoked and state contracts denied and/or revoked when they are found to have hired unauthorized employees. Employers are being targeted for a variety of criminal sanctions, including harboring illegal aliens and money laundering, in addition to the criminal penalties contained in the employer sanctions and anti-discrimination clauses within the Immigration Reform and Control Act of 1986 (IRCA). Twenty-three states have now passed employer sanctions laws; and of those 23 states, 8 states require all employers who meet jurisdictional standards to use E-Verify, while 12 states require contractors working with state or local governments to participate in E-Verify. The Solution: The I-9 and E-Verify Handbook: A Guide to Employment Verification and Compliance provides comprehensive information on a topic that affects every employer in the country regardless of whether the company hires foreign employees. Written by Bruce E. Buchanan and Greg Siskind, two of the nation’s top business immigration and employment/labor attorneys, The I-9 and E-Verify Handbook serves as a one-stop shop for those who need to know the intricacies of the I-9, E-Verify, and anti-discrimination laws and regulations governing the U.S. workforce. In 2007, after President George W. Bush’s efforts to pass Comprehensive Immigration Reform failed in Congress, enforcement began to increase at the federal level. During the first six years of President Barack Obama’s administration, worksite enforcement increased to unprecedented levels, and it has begun to increase under President Donald Trump. 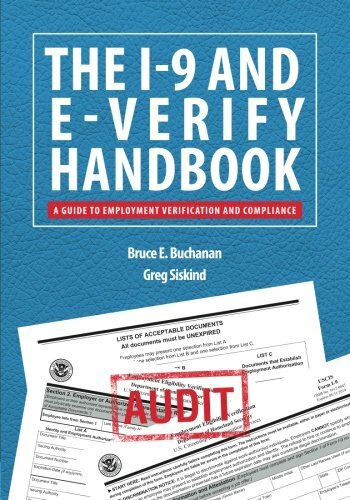 Because Buchanan and Siskind have represented U.S. employers of all sizes in immigration, employment/labor law, and worksite compliance, they have written The I-9 and E-Verify Handbook as a guide for human resource professionals, recruiters, attorneys, and even government officials who need to understand the array of compliance-related statutes and regulations. The Handbook is organized in an easy-to-understand, question-and-answer format with illustrations, checklists, and sample documents, which give the reader the tools to implement and improve any employment compliance program. The I-9 and E-Verify Handbook contains detailed answers to the most common questions about the I-9 and E-Verify process, such as: • What is the Form I-9 and when must it be completed? • What is the employee’s/employer’s responsibility when completing Form I-9? • Does an independent contractor need to complete a Form I-9? • Can an employer specify which documents to accept from an employee? • What if an employee changes his or her name? • What are the Form I-9 re-verification requirements? • What is E-Verify and how does it work? • What are the best ways to prevent being prosecuted for Form I-9 employer violations? • When would an employer be considered to have “constructive knowledge” of unlawful immigration status? • How is a complaint filed for an Immigration Reform and Control Act anti-discrimination violation? And many more!